Globally, forests cover one-third of the Earth’s land mass, and support the livelihoods of around 1.6 billion people.More than 80% of land-based animals, plants and insects are found in forests and they also protect watersheds and provide us with clean air and water.United Nations International Day of Forests, now in its second year, aims to promote awareness of the importance of all types of forest. The day was fittingly celebrated by a group of Bangor University forestry students, who marked the occasion by creating their own “forest”. 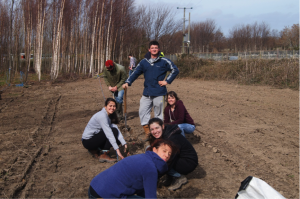 Following the successful award of project funds from Bangor Students’ Union, Bangor Forestry Students Association (BFSA) was able to purchase 500 tree seedlings, plus tree protection material and planting equipment. 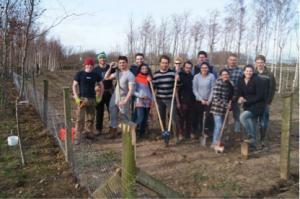 14 students gave up a day of their own time to create the forest, which in time will provide a local and sustainable supply of Christmas trees for Bangor University staff and students, with any future profits being split between similar BFSA activities and the Size of Wales project. Bangor University donated a suitable site at the Henfaes Research Station, Abergwyngregyn. Photos courtesy of Gruff Rhys-Sambrook and James Walmsley.